A simple solution for including hyperlinks without undermining focus. I’ve written previously about the distracting effects of excessive hyperlinks: how lots of “hey, click me” blue-lined text makes it hard to focus on a writer’s own writing. In this post, I want to air out a design idea that accommodates links, but does so in a way that helps readers maintain focus and momentum. 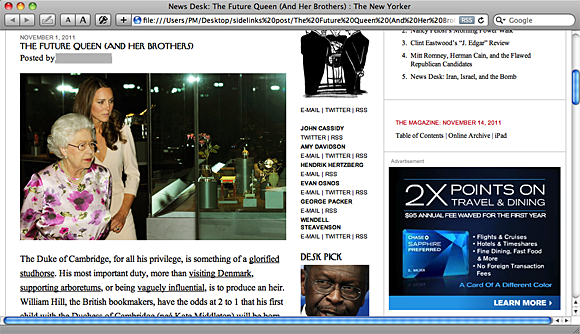 Example of web article with way too many links (click to enlarge). Links removed from the body text and placed, with brief commentary, in the margin (click to enlarge). Eliminating hyperlink distraction. I can’t be the only one out there who finds the mere presence of hyperlinks distracting. Even the majority of times when I don’t follow the links, I find myself struggling to ignore the noise of the unknown: What awaits if I follow that link? Why did the author put the link here and not beneath some other phrase? My mind wanders when what I really want is to focus. Enabling link evaluation. Sometimes all we readers need is a bit more info about what a link points to. Then we can make better decisions about whether the click or tap is worth our time. In the original excerpt I posted, a curious reader can right-click the link to expose the URL — that at least reveals a citation’s source. But is it worth taking the time to do so? And do most readers even know that trick? I think that simply adding a smidgen more info — for example, what I added in my sketch — could help readers quickly judge the value of the target. Offering the possibility of adding “read later” tools. Most people know about “time-shifting” reading services like Instapaper and Read It Later. They’re great for scooping up worthwhile reads that we don’t have time for during a busy day. I think it might be interesting to implement a similar service in a document-specific way. That is, give readers a quick way to say, in effect, “that linked article looks great; please hang onto it and give it back to me when I’m finished reading this piece.” I didn’t add that feature to the sketch, but doing so would be a relatively simple matter of adding in some kind of “read it later” icon next to each link. Digital documents — books, web articles, business communications — that help readers focus are the ones that we’re most likely to remember. Those that send us scampering around the Web will be more easily forgotten. Linking in ebooks: How much is too much? Open Question: Does a link = endorsement?